.PENUMBRA. SPRING SUMMER 2015 FASHION ANNOUNCES SHOW SCHEDULE – .PENUMBRA. Reblogged this on Amity Style. Reblogged this on Landa Crystal. Reblogged from Penumbrasl.com the press release about the Spring/Summer Fashion Week. And the countdown begins….tick tock tick tock tick tock . Reblogged this on Silvano Korobase. Reblogged this on I rather be overdressed! fashion in secondlife. Your .PENUMBRA. Spring/ Summer ’15 Fashion Week Schedule is here! Save Your Lindens Fashionistas and Fashionistos! .PENUMBRA. Fashion Week Spring Summery 2015 opens Next Saturday, May 16th! Reblogged this on Dream Love. 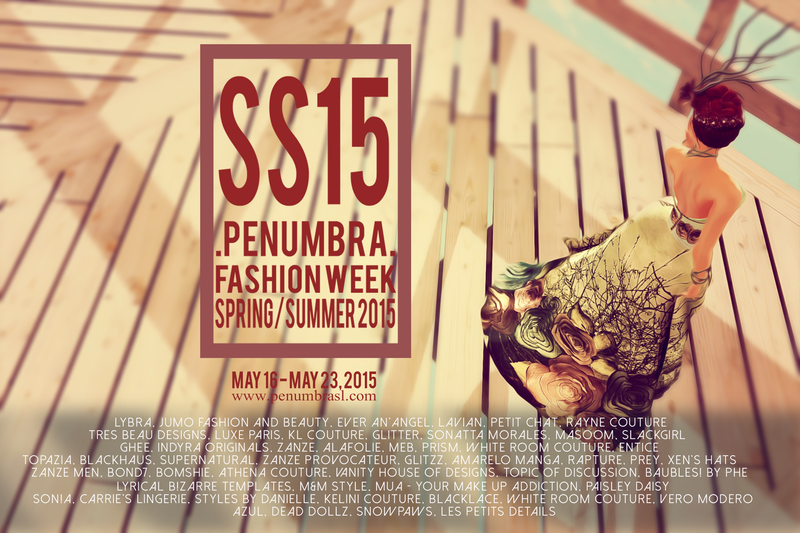 Pingback: SlackGirl for Penumbra's Fashion Week SS15 (Post-222225) - [O.L.D.] Old London Docks - Best Second Life Fashion and Lifestyle Blog Feeds! Reblogged this on Steals, Deals, and SL Sim Appeal.